Ambe Dal was the star of this year’s Gudi Padva also known as Ugadi or Yugadi also the Hindu New Year! 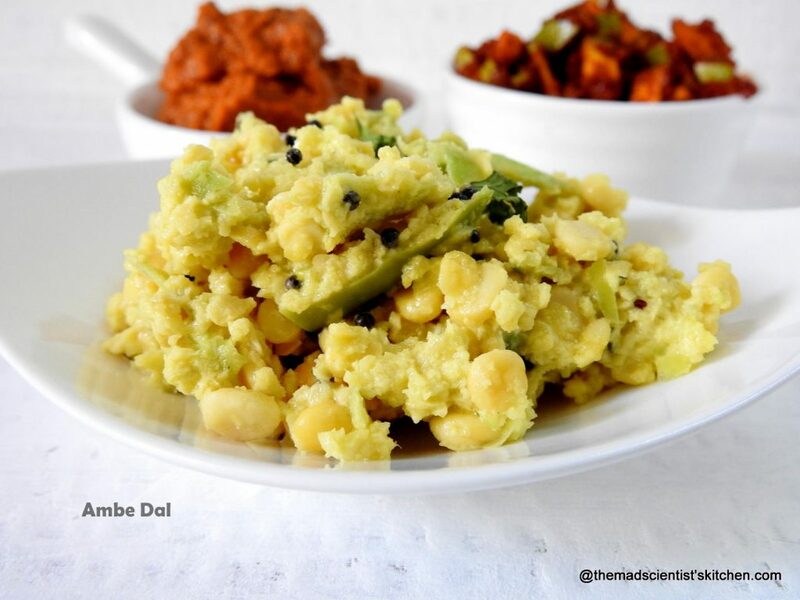 Ambe Dal is a Maharastrian salad of green mango and chana dal where unlike the Sautikai Kosambri there no cucumber is added. Padwa is celebrated in Chitra is the first month of the Hindu calendar and Shukla Pratipada it is the first day of the month. What is Pratipada and what is Shukla Pratipada? According to Hindu calendar, which is Lunar, Shukla Paksh is the bright half of the month and Pratipada is the first day. The other words for Partipada okay the first day are d पाडवा (pāḍavā) or पाडवो (pāḍavo). In south India, the first day of the bright phase of the moon is called pāḍya. Konkani Hindus variously refer to the day as संसर पाडवो or संसर पाड्यॆ (saṁsāra pāḍavo / saṁsāra pāḍye). In Karnataka, we also call it as उगादि, ಯುಗಾದಿ (ugādi).” I am quoting Wikipedia here but to make the long story short we are celebrating Hindu New Year here today. Celebration naturally means a celebratory lunch, something delicious and yummy. 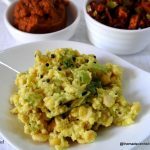 Most Indian cooking traditions have nature in mind. The use of local and seasonal foods is emphasised on. So for Nagpanchmi we have steamed food patoli, or kuchid kadab steamed kadbu, for Ganesh which is it rains we have ukdiche modak/ Steamed Rice Dumplings. For Diwali when there is a nip in the air we have fried stuff like chirotti, etc. Gudi Padwa or Ugadi when raw, unripe mangos are abundant in markets, before Summer there is Mainkai Chitra Anna whether I want it or not and some salad with raw mango. Since hubby and the girls are not too fond of sweets we have none or only jelabi. Hubby does not care much for Chitraanna but then there is always chapatti and vegetable and dal that I make for my father-in-law on which he can depend on. 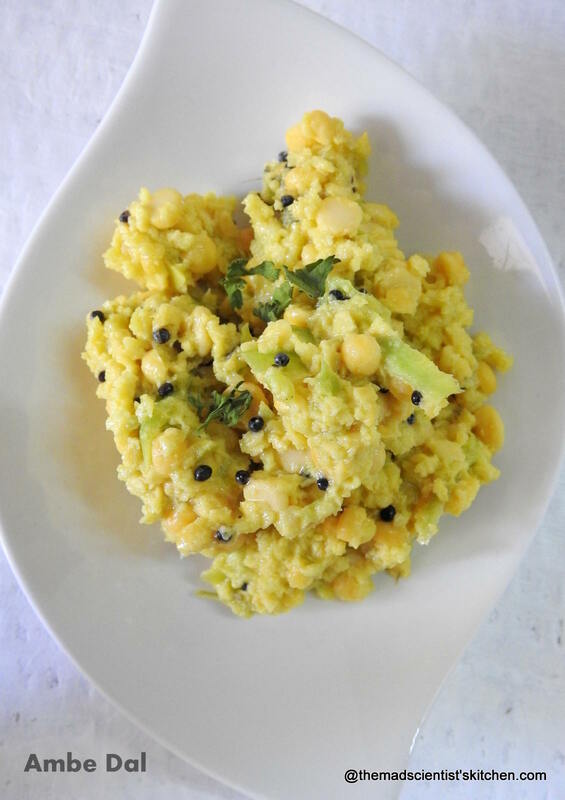 This Gudi Padwa I wanted to make Ambe dal, a Maharastrian salad of green mango and chana dal where unlike the Sautikai Kosambri there no cucumber is added. I asked my SIL, the elder one who is an encyclopaedia of food for her help. On her confirmation, I set out to make it. Traditionally, Ambe dal is accompanied by sweet and sour raw mango drink called Panha. For Gudi Padwa or Ugadi when raw, unripe mangos are abundant in markets make Ambe daal. Soak chana dal overnight or for 6 hours in the water. Set aside a tablespoon of the dal and grind dal coarsely in chutney pot of your mixer with 2-3 green chillies and a few springs of dhania/ coriander leaves. Transfer to the serving bowl. Peel raw mango and grate it. In a small kadhai/wok heat oil. Add mustard seeds let them splutter then add hing/asafoetida powder, haldi/turmeric powder. Add immediately to the ground chana dal. Add salt to taste and a little sugar. Add chopped dhania/coriander and grated raw mango. Mix it well and serve. If you need you can add more chillies and /or grated mango.The addition will depend on the spice level and the sourness of the mango that you can stand. Mango is a seasonal Fruit, and if it is not available you can add lime juice instead. Can be eaten as a snack or as a side dish, a salad.